The citrate test is used to determine the ability of a bacterium to utilize citrate as its only source of carbon. Bacteria can break the conjugate base salt of citrate into organic acids and carbon dioxide. The carbon dioxide can combine with the sodium from the conjugate base salt to form a basic compound, sodium carbonate. 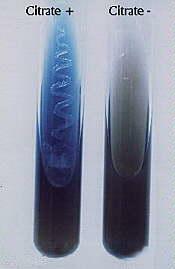 A pH indicator in the medium detects the presence of this compound by turning blue which is a positive result. o Streak up the slant with the inoculum. o Incubate at 25 or 37 degrees C.